The new release of extremely cute stamps is up at the High Hopes Website, if you are curious go and check them out here... Have you seen the absolutely adorable little girls?? I can't wait to get them!! In the meantime I want to show you a High Hopes image that has been released in february. I couldn't resist and create a friendship card with it. The stamp is called Lenny's Love Me Nots and is part of a bunch of cute dragon stamps. The theme at the High Hopes challenge blog is "distressing". I distressed all borders of the wonderful Cosmo Cricket paper and also the water colour paper on which the image is stamped. I designed the sentiment on the computer. It means "You are a special friend". In der Zwischenzeit will ich euch eine Karte mit einem High Hopes Motiv des letzten Release zeigen. Ich mußte einfach eine Freunschaftskarte damit machen. Der Stempel heißt Lenny's Love Me Nots und ist Teil einer Reihe von süßen Drachen Stempeln. Das Thema des High Hopes challenge blog diese Woche ist "distressing". Deswegen habe ich alle Kanten des wundervollen Cosmo Cricket Papiers und auch das Aquarellpapier auf das ich das Motiv gestempelt habe distressed. Den Text habe ich am Computer erstellt. I coloured the High Hopes image with water soluble pens and Twinkling H2Os. I also put some red Flower Soft on the flower. Ic hhabe das High Hopes Motiv mit Aquarellstiften von Caran D'Ache und Twinkling H2Os coloriert. Ausserdem habe ich etwas rotes Flower Soft auf die Blume geklebt. The base of my flower is a Woodware flower punch. I also used a cuttlebug flower die for the red leaves, the crocheted flower was sent to me by my dear Bev( Thanks so much Sweety!) as well as the center of the flower. I got the huge heart at embellishments.de and adhered it to the brad with a small chain, the way Bev shows on her blog. The leaves are done with a Martha Steward punch and a SU Sizzit die. Die Grundlage für meine große Blume ist ein Woodware Blumenstanzer. Ich habe auch noch ein cuttlebug flower die für die roten Blätter verwendet. Die gehäkelte Blume kommt von meiner Freundin Bev (Vielen lieben Dank!) und das große Herz habe ich von embellishments.de. Angemacht habe ich es an dem brad mit einer kleinen Kette, so wie es Bev auf ihrem Blog zeigt. Für die Blätter habe ich einen Martha Steward Stanzer und ein Stampin' Up Sizzit die verwendet. Ich danke euch sehr für euren Besuch! 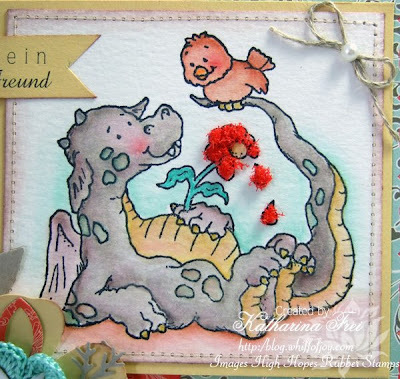 Paper: Cosmo Cricket Ever After, SU cardstock "So Saffron & kraft"
Gorgeous card - love the dragon image. 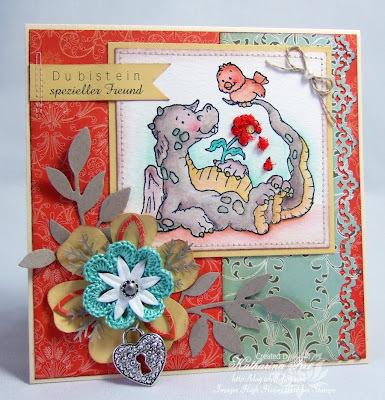 Wowww Katharina,what a beautiful card,l love the image and colours. oh wow don't know where to start hun,..
Wow this is just wonderful! Lovely card Katharina, lovely colors to. 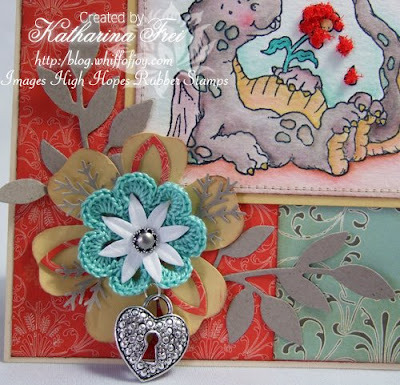 This is an incredible card Katharina! I love this image!! Gorgeous card, I adore that image, so sweet. Die Karte ist ja absolut oberknuffig bzw. das Motiv :-)) die Karte ist klasse geworden.